Scott Ertl has learned the value of community partnerships to support the Read and Ride program. He recommends asking a local bike shop to help when repairs demand expert attention. An offer to post a sign in the exercise room that recognizes the business for its help can be all the thanks required. "Since exercise bikes are mostly made for adults, you will probably need to drill extra holes in the seat posts to better accommodate children riding the exercise bikes at a lower height," Ertl advised. "Adjust some seats for younger children and others for older children. That will help children know which bikes they can comfortably ride, and prevent injuries." Most children are eager to ride the bikes and to show how fast they can pedal. Staff members, however, can be a little wary of trying something new, especially if they are fearful students might not be successful from the start. "It is important to review the rules and expectations, as well as to reward students who obey the rules," added Ertl. "When students do not obey the rules, there should be consequences -- like sitting out while others participate." "As school counselor, its important for me to help students become healthier in mind and body. Considering our high rates of childhood obesity, Read and Ride seemed like a perfect way to promote wellness and literacy in a fun way," says Scott Ertl. After reading a magazine while riding an exercise bike at the gym, Ertl was inspired to give his students at Marvin Ward Elementary School in Winston-Salem, North Carolina, the same experience. He shared his idea with friend, and quickly discovered that countless people have exercise bikes or other exercise equipment in their attics or in the corners of their bedrooms under piles of clothes, and many are willing to donate those underutilized machines to schools. "We have 30 exercise bikes in our Read and Ride room. Teachers sign up for their classes to come for 15-minute periods so every student can ride a bike while reading a magazine or book," Ertl told Education World. "Some teachers sign up every day; others bring their class once a week or as a special reward." There are also 11 exercise bikes in individual classrooms. Teachers allow students to ride the bikes individually as an incentive when classwork is completed, or when a student needs to release extra energy. "I've been surprised how eager some students have been to read -- especially boys," observed Ertl. "Because they love being active, they find that the movement allows them to have more fun reading. 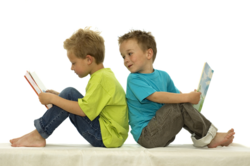 Many students previously thought reading was boring or too hard, but now they see reading can be fascinating and fun." Kori Brazda, a resource teacher at the school, works with students who have learning disabilities. She attempts to motivate students to read, but their individual struggles often impede their progress. They often experience hesitation when it comes to reading, and many feel they "can't read" and "won't ever read." Some are adamant about "never reading." "For most of those students, reading reminds them they are different," says Brazda. "I cannot tell you how many days Ive found myself in tears trying to think of new ways to motivate them and show them the fun in reading." When approached about the Read and Ride program, Brazda couldn't imagine finding a place for one more teaching tool in her classroom. Ultimately, however, she decided to make the space. "My students, no matter their grade, age, or disability, now have one thing in common -- they love to 'read and ride!" she reports. "It has made me incredibly happy as an educator to see the motivation come alive in these students. My students, although they still struggle on a daily basis, now want to read. Words cannot describe the difference this program has made in my classroom." To extend the reach of this combined learning and fitness activity, parents are invited to use the Read and Ride room at the end of the school day. When adults join in the fun, they model reading with their children and promote good health. Educators who are interested in the progress of the program can join the group on Facebook and Twitter to receive updates. Word of Read and Ride has spread through its Web site, spawning similar programs in other schools. Students at Marvin Ward Elementary already have logged about 3,500 miles, more than enough to surpass their first goal of pedaling from Winston-Salem to Los Angeles, California. From an academic standpoint, theyve invested 870 extra hours in reading. Students in Abby Brown's classroom use AlphaBetter "standing desks." Ertl is currently raising funds to purchase generators for the exercise bikes so students can see how their energy can power the lights in the room. Donors can send checks payable to "Ward Elementary School" to the school at 3775 Fraternity Church Road, Winston-Salem, NC 27127. At Marine Elementary School in Marine on St. Croix, Minnesota, sixth grade teacher Abby Brown literally has her students on their feet. Her classroom features "standing desks" that allow students to stand, move their feet, or sit on stools during class. "The assumption is that this type of option would be best for students with ADHD and boys, but the reality is all children benefit from it (as do the adults who use these desks)," says Brown. "Every child is different and throughout the day, each child adjusts individually to positions that allow focus. Some of my top academic achievers stand a good share of the day and use the swinging footrest. From special education to gifted, this should be seriously considered for learning and health." The AlphaBetter desks used by Brown's students were designed by Tim Skiba, President and CEO of Sunway, a Wisconsin-based office products manufacturer. Guidance from Brown and other teachers played a significant role in the design of the height-adjustable desks. A unique feature of the desks is a swinging footrest that can channel students' excess energy (i.e. fidgeting), and burn extra calories. Teachers who use the desks report that the movement is subtle and less distracting than wiggly kids who are trying to get comfortable in traditional desks. Through grants, Brown's building acquired enough standing stations for every child. "Other classrooms might just have a few [standing desks] to start, but the change is natural and doesn't require a different classroom management system," Brown stated. "There are fewer requests for bathroom breaks and drinks, although there are still those students who need an excuse to get out of working on their math." "Read and Riders" exercise their bodies and their brains. Brown's students confirm they feel more energetic and less tired when they come home after school. Former students who have recently moved on to junior high tell Brown they have trouble staying awake and feel fatigued in traditional desks. Even in the standing desks, students are not required to stand all day. They sit on stools when they choose, most often after physical education or recess breaks and at the end of the day. "We are watching for changes in students over several years. Thats a part of our on-going research, but I can say with confidence that the benefits of this one change will make a difference in the health of future generations," observed Brown. "Leg strength and posture also are impacted. Some kids complain about no backs on the stools; slouching is tough to do without them. Thats a good thing!" To see the difference a standing desk makes in energy and focus, Brown recommends purchasing just one as an option for the classroom. Interest will grow and build support for more desks, if that type of seating is right for the room. Information about the AlphaBetter Desks made by Safco Products is available at Stand Up for Learning. "I know I focus more and don't try to get up as much," says Tiffany Miller. For years, the fourth grade teacher has relied on a stability ball as her "chair" in the classroom. During her first year teaching, students asked to sit on the stability ball as a reward. She relented, and once shed observed how attentive students were while on it, she did some research and wrote a grant to obtain a set of balls for her entire class at Bauder Elementary School in Fort Collins, Colorado. "Once I knew the grant was approved, the kids and I did research together and really talked about why we were doing this," Miller recalled. "The kids were very into the thought of having more blood flowing to the brain, as well as having the body and mind engaged." Miller invited skeptical parents to come and see the classroom and learn from students about the stability balls and why theyre healthier "chairs." Using a ball in lieu of a traditional chair always has been an option in Miller's class. She teaches students to sit properly on the ball and use good posture. The process takes time, but Miller insists the results are worth the investment. Students like Elizabeth pedal their way to better reading skills and better health. "The kids have a hard time adjusting the first week or so, but after that their bodies are trained to sit up straight and have the core turned on," explained Miller. "In fourth grade, the human body is part of our curriculum, so we speak often about the muscles and the brain." With stability balls as "seats," students take fewer restroom breaks and have less reason to leave the room or move about. Because stability balls are not necessarily designed to absorb constant daily use or to stand up to woodchips, staples, and other debris commonly found on classroom floors, they might deflate. Miller spends about $100 per year on new "chairs" and always has spares on hands, so no one goes without a seat. "I don't believe this practice is more beneficial to only one group of students, but I can say that for my age group, it has made my job easier," Miller shared. "Other teachers don't have stability balls, and the kids would love to roll their ball to any room. I also believe my ADHD kids are more successful because theyre constantly working on being stable and focused. I can keep their attention for a longer duration of time." "Bouncing" alongside Miller's students are Melisa Tennant's seventh graders in White Bear Lake, Minnesota. In 2008, Tennant encountered research suggesting students internalize learning more when its associated with movement, but the focus of her Sunrise Park Middle School classroom was primarily reading and writing, so she needed a way to allow students to move without generating distractions. An article led her to the idea of stability balls as chairs, and when efforts to obtain grant money failed, a parent volunteered to sponsor the purchase for the classroom. "Initially, students found the balls interesting and exciting (some a bit too much so)," admits Tennant. "I instituted a contract policy, in which students earn the balls after passing a safety quiz and receive a consequence if one of the safety rules is broken." Students at Marvin Ward Elementary burn calories in the "Read and Ride" room. Now in her second full year of teaching with stability balls, Tennant notes that, after the first few weeks of school, the novelty wears off and students begin to treat them as they do typical chairs. "The biggest difference is that students are able to rock, lightly bounce, and balance on the ball while learning," she reports. "As a teacher, Ive found that the beginning of the year feels a bit like sailing on a ship and looking out over a bobbing horizon. I feel the stability balls offer students a much needed change in routine and environment in their busy academic day." Tennant is convinced that using stability balls improves posture, enhances attention and concentration, and promotes learning through "active sitting" and movement, especially during her reading and writing workshops. "I began by collecting baseline data about my students, related to attention, memory, physical stamina, and test scores," added Tennant. "I transitioned my students onto the balls and then continued to collect data through the next year. While I can't yet connect the data findings to the balls, I would not trade them back for chairs."